Coffee Festivals come thick and fast this time of the year. The end of September saw not one, but two inaugural festivals, the New York Coffee Festival, and, slightly closer to home, the Northern Ireland Coffee Festival. Then, last Saturday, along came the first Edinburgh Coffee Festival, while this weekend, it’s the turn of Prague’s Coffee Festival. The coming weekends see two of last year’s favourites making their second appearances. At the start of November (7th/8th), Cup North returns to Manchester, while next Saturday (October 17th) we have the return of the Glasgow Coffee Festival. Sadly I wasn’t able to make it last year due to various diary commitments, plus Glasgow annoyingly being at the other end of the country from where I live (how dare it!). This year, however, it’s been circled on my calendar for a long, long time. Held in the Briggait, a soaring hall that was built as Glasgow’s fish market over 100 years ago, it’s just around the corner from festival organisers, Glasgow’s very own Dear Green Coffee roasters. Tickets are just £11.25 (including booking fee), which gives you access to nine hours (10:00 – 19:00) of coffee-based events, including the UK’s first-ever roasting championships. PS If you’re heading up to Glasgow for the Festival, don’t forget to check out my Coffee Spot Guide to Glasgow for some of my favourite places to go. You can find out more after the gallery. Although this is the Glasgow Coffee Festival (largely because it’s held in Glasgow), it’s really a celebration of the growing specialty coffee scene in Scotland (and beyond). Designed as a one-day showcase of quality coffee, the festival will feature a multitude of coffee contributors, exhibitors, masterclasses, workshops, presentations and demonstrations! Sponsors include American roaster manufacturers, Diedrich, green bean importers, Falcon Specialty, and Mercanta, coffee consultants, Coffee Nexus, equipment suppliers Espresso Solutions and kings of espresso machines and coffee makers, La Marzocco, Aeropress and Bunn. 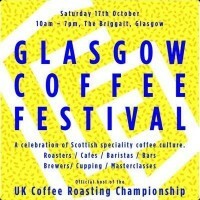 And, of course, Glasgow’s very own Dear Green Coffee, which is organising (curating) the whole thing. So, what can you expect? Well, there’s the usual coffee festival things: competitions, latte art lessons, cuppings, demonstrations, plus a chance to catch some art, film and photography, including Wil Freeborn, who is doing another of his coffee-themed calendars this year! There will, of course, be bags of coffee (literally and figuratively). Rumour has it that the famed Press Coffeehouse will be there too (just as long as he doesn’t bring that Paul Henry fellow long). The list of contributors reads like a who’s who of Scottish coffee, plus a few English interlopers and folks from even further afield. I’m reliably informed that there’ll be at least one Canadian and one Welshman in attendance. Not to be outdone, Edinburgh has Artisan Roast (also flying the flag for Glasgow) and filter pioneers Brew Lab. Made by Knock will also be representing Edinburgh with beautiful, handmade tampers and grinders. Meanwhile, from further afield, there’s Stirling roasters, Ovenbird, and, flying the flag for the Highlands, Glen Lyon Coffee Roasters, coming down from Aberfeldy. England’s represented by a quartet of roasters/suppliers. Carvetii is making the relatively short journey from Cumbria, while J Atkinson & Co. won’t be far behind on the way up from Lancaster. From further afield, there’s Coopers from Huddersfield, while the guys from Foundry Coffee Roasters are travelling up from Sheffield. If you think that’s a long way, spare a thought for Terrone, which is coming up from London just so that Edy Piro can photobomb me, and Five Elephant, jetting in all the way from Berlin (that’s even further than me!). If it’s kit you’re after, there’s Caffeine Fix, while those with a sweet tooth won’t be disappointed with Three Sisters Bake and Sugar Wings. Finally, if coffee’s really not your thing (or you just fancy a change), Brew Dog, Kokoa Collection, and (whisper it quietly) the Dormouse Tea Company are in attendance! If that wasn’t enough, in something of a coup, the festival’s hosting the first UK Coffee Roasting Championship, sanctioned by the SCAEUK. Participants will compete to see who can produce the best roast from the same single origin coffee beans. So, what are you waiting for? Get your tickets before they sell out! Even better, thanks to Glen Lyon Coffee Roasters, you can add the code GLENLYON@GCF at the ticket checkout for a 20% discount! Your ticket includes a hot drink and entry into a prize draw.